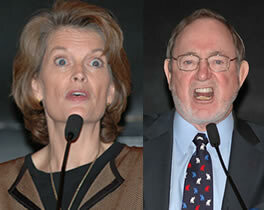 Don Young, under multiple criminal investigations, and Lisa Murkowski, who funneled taxpayer money to road for her home, have accepted the corruption of Ted Stevens and blame the prosecutors in his case for bringing "trumped up" charges. Senator Lisa Murkowski - "Given today's verdict, it's a sad day indeed for Sen. Stevens and his family as well as for Alaska. Ted Stevens is an honorable, hard-working Alaskan who has served our state well for as long as we have been a state. It was clear that the prosecution blundered in several instances. Given these gaffes, which raised the ire of U.S. District Court Judge Emmet Sullivan on several occasions, Sen. Stevens has announced that he will appeal the verdict. I look forward to having justice served." "Ted has asked for Alaskans and his Senate colleagues to stand with him as he pursues his legal rights. He stood with Alaskans for 40 years, and I plan to continue to stand with him." No stranger to corruption, Republican Senator Lisa Murkowski secured $6 million in federal funds to build a road leading straight to a plot of land she bought - but was forced to sell - after being exposed July 16th by the TPMmuckraker website. "If you look at not reporting, supposedly gifts -- he reported everything he got. I think it was wrong when they prosecuted him on this issue." Young, under four separate criminal investigations himself, also said "I don't think he had a jury of his peers." There were 12 jurors in the Stevens trial. Ten were African-American. Is that line a code for something Don? Alaska's Republican Party spokesman McHugh Pierre jumped on the "Crime is OK if you're a Republican" bandwagon with "We need to continue to support Sen. Stevens. We need to vote for him because a vote for him is a vote for a conservative candidate, a Republican who best represents the interests and beliefs of Alaskans. ... We don't know what happens in the future. But if you don't want Mark Begich, you vote for Ted Stevens."